My two inspiration artists are Emily Gravett and Shaun Tan. I am very much into children’s illustration and I would love to publish my own book some day but first I have to study and work hard to become a master of my skill. Emily Gravett is a children’s illustrator and has created books such as Little Mouse’s Big Book of Fears and The Odd Egg. She studied BA Illustration at Brighton University and she has won many awards including Macmillan Prize for Wolves. I love her work because I think it’s original but has a modern feeling to it. Using unusual techniques such as putting yoghurt on the pages and her daughters pet rats would chomp on the paper creating a realistic nibbled paper. The pages look old, ripped and stained which gives it an authentic look to it. I always feel like my images have to be produced on crisp white paper so I might experiment more with the actual paper I’m using as well as the materials I put on there. Although she mainly uses watercolours and her self taught computer skills to create the final pieces of work. The main reasons why I like her work are the amazing perspectives and the creativity/imagination she has given to the main character and scenario they are in. For example the image above is the mouse falling down the sink plug hole, instead of going for the obvious scene she has incorporated photo snapshots of the event happening allowing your eye to follow the swirling of the water. Again she has used different materials to illustrate the fear and scariness these characters are experiencing. I use digital collage to create my images but Emily scans in real materials to show the texture and item that is feared by the mouse. The colours are quite neutral, browns, blues and red throughout which could be classed as not colourful enough for a child to enjoy it but I totally disagree as they would appreciate the characters and drawings more. It made me think bright colours doesn’t work for every illustration and can actually harm the image. I think the mixture of the owl being created using pencil and the feathers being real adds depth to the page and adds another dimension to it. The little latin names of the fears displayed on the page adds an educational value to the books, the viewer will learn as well as go on an adventure with the mouse. From looking at Emily’s work I will definitely consider looking into creating work that has unusual perspectives but add extras that could enhance the image like the mini photos Emily has added. I will also look into using other materials rather than scanning in bits of cloths all the time. 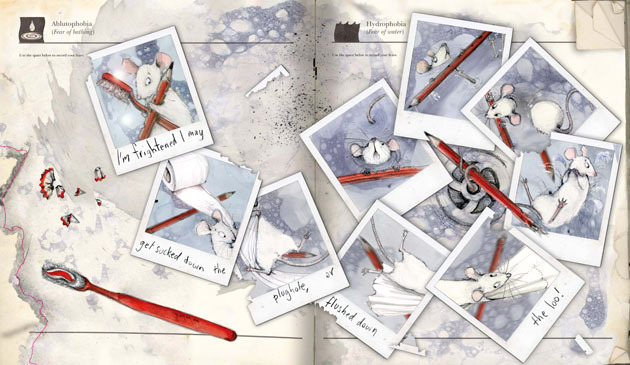 2008, Emily Gravett, children’s illustrator [internet]. Available from: http://www.theguardian.com/books/gallery/2008/jun/26/art.booksforchildrenandteenagers#/?picture=335286657&index=0, [Accessed 29 January 2014, 2.30pm]. 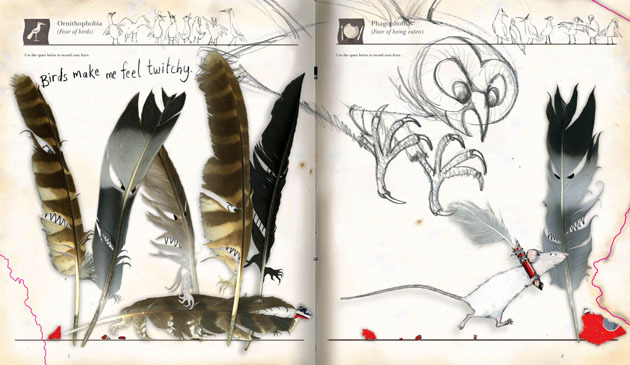 This entry was posted in Artist Inspiration - Emily Gravett.